Lucy Lores (green shirt), a nutrition educator with the Oregon State University Extension Service, teaches healthy cooking and food safety in a program for Hispanic families in the Portland area. Photo by Lynn Ketchum. A dozen women in black aprons clustered around a kitchen island chopping onions, shredding chicken and chatting in Spanish. At a community center in Gresham, they were making chicken chili in a nutrition and exercise program for Hispanic families taught in Spanish by Oregon State University’s Extension Service. The free eight-week class helps participants with the fundamentals of healthy eating such as choosing more vegetables over too many carbohydrates, baking instead of frying and substituting water for soda. Extension offers the course every four months in nine communities in Multnomah, Clackamas and Washington counties. 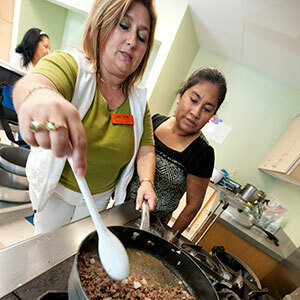 Since the nutrition education programs launched 12 years ago, more than 6,300 adults and 9,000 children have taken classes, according to Lynn Steele, leader of OSU Extension’s Hispanic nutrition program in the metro area. The Hispanic nutrition program is overseen by Extension’s Family and Community Health program in OSU’s College of Public Health and Human Sciences. It is part of OSU Extension’s statewide nutrition education program for limited-income Oregonians, which is funded by Oregon’s Department of Human Services. A video on the Hispanic program can be found in English and Spanish. Lucy Lores, an educator with the Oregon State University Extension Service, demonstrates a healthy recipe during an eight-week nutrition education program for Hispanic families in the Portland area. Photo by Lynn Ketchum. Hispanic immigrants often eat less nutritiously once they leave their traditional diets and lifestyles, said Steele. Health problems such as diabetes and high cholesterol spike as they begin eating the high-fat, high-sugar diets common in the United States. Women in the course in Gresham heard about it from Extension’s volunteer community health promoters who work with churches, community centers and government social service agencies to identify people who might benefit from the program. Lorena Caballero, who took the classes more than 10 years ago, is now one of the promoters. Christina Ramirez, who has completed several courses, spoke through a translator about having diabetes on both sides of her family and a pre-diabetic husband. In addition to healthy eating, she has added an exercise regime that includes walking, Zumba, yoga and weightlifting. As a result, she has lost 24 pounds in 18 months. When the women finished cooking and moved on to the exercise portion of the class, they marched in place swirling orange, pink and yellow scarves as their young children ate healthy snacks, drew pictures and played. Bonding between families is an added benefit. Candida de Jesus said she had been depressed. Most of the women in this particular class started their journey in a Walk With Ease course offered by OSU Extension and designed for people with chronic problems such as arthritis. Participants walk for as long as they can, two to three times each week, and get familiar with the importance of exercise. Upcoming Hispanic nutrition classes start in October in Aloha, Beaverton, Cornelius, Forest Grove, Hillsboro, Portland, Sandy, Tigard and Troutdale. For days and times, contact the OSU Extension office in Portland at 503-254-5004 or in Washington County at 503-821-1134.